Champagne is the standard by which all other sparkling wines are measured. Good Champagne is costly due to the high price for grapes and the amount of hand-labor required. We feature excellent French Champagnes as well as good alternatives from California, Italy, Spain, Germany, etc. The French are big on protecting the name "Champagne," as it represents a geographical place name as well as a tremendous amount of money. To be called "Champagne" in France, the wine must come from grapes grown within the region of Champagne and be made within the boundaries of that region. The law encompasses grape varieties, production methods and aging requirements. California wineries use the word "Champagne" on their bottles and the French have challenged this. Unsuccessfully. U.S. courts have ruled against the French on this. California wineries have been calling their sparkling wines "Champagne" for too many years. It is sad to see the words "Andre" and "Dom Perignon" under the same heading! Of course, California wineries would be up in arms if the French started making wines called "Napa," "Sonoma," or "Stags Leap." The Champenoise have seen the damage to Chablis. Most Americans are surprised to learn that (YES!) they produce "Chablis" in France, too! Few understand that "Champagne" and "Chablis" are regions as well as "wine types." California wines using those names have little in common with their French counterparts. First....Champagne is a region. The northernmost in France. It's 90 miles north-east of Paris and it's a great place to visit! Champagne is not a huge area, but it is twice the size of Beaujolais or Alsace, for example. There are some 15,000 growers, averaging about 2.1 hectares of vines each! Three grape varieties constitute Champagne. Two of them are red, the Pinot Noir and the Pinot Meunier. The only white grape is the Chardonnay. Virtually every firm will tell you they use primarily Chardonnay and Pinot Noir, yet Pinot Meunier accounts for about half the vineyards in the region. Hmmmm. Make you wonder, doesn't it? A few houses will admit to using Pinot Meunier, especially Krug (! ), Billecart-Salmon, Jacquesson and Pol Roger. Pinot Noir, accounting for 30% of the vineyards, is particularly fine in the Montagne de Reims. Plantings are on the rise, though, in the Aube, the southeastern pocket of Champagne bordering Burgundy. Chardonnay seems to do best in the chalky soils of the C�tes des Blancs south of Epernay. The grapes are harvested at a relatively low sugar and fairly high level of acidity. Most of the firms have press houses scattered around the region, so the fruit doesn't have a long trip from the vineyard. Visit the large firms and you'll find huge fermentation tanks, neatly polished and looking like something out of a sci-fi film. "Smaller" firms such as Roederer, for example, have a tank farm with an amazing variety of various sized stainless steel. This is because they purchase fruit from so many villages....the houses explain they like to keep each "wine" separated to facilitate producing a consistent blend. Most firms put the juice into a settling tank and allow the juice to settle a bit of sediment. Almost everyone ferments the base wines in stainless steel tanks, though Krug, Gratien and Bollinger still use wood for, at least some of, the primary fermentation. Again, the claim is that they're keeping each village's wine separated. Once the wines have fermented, there's a question of malolactic fermentation. Many firms induce this secondary fermentation, while others inhibit it, preferring the crisper edge of non-malolactic fermentation wine. The next bit of business, after assembling the base wine or "Cuv�e," is putting the bubbles into the wine. The larger firms buy fruit all over the region of Champagne and can blend to create their blend. Small growers usually have fruit in but one or two villages and must make do with what they have. Some will tell you this is the advantage of a large firm. Others claim the growers make a unique product, one displaying the "terroir" which you won't find in a large firm's Champagne. Having tasted many large producer's products and quite a number of the small, grower's wines, I can say there is room for both on the table. Once blended, the liqueur de tirage (yeast, sugar and, perhaps, some reserve wine) is added to the bottles filled with "still" wine. These are then stoppered and the secondary alcohol fermentation takes place within each and every bottle. The bottles are laid away in the cellars where the fermentation proceeds until its conclusion. The wine is then aged "en tirage" for a minimum of 15 months. Virtually every major Champagne house claims they age their non-vintage (today they prefer to call these "multi-vintage," since they usually are based on one year with some older reserve wines added) wines for three years. This is difficult to believe if you taste the wines of Bollinger or Charles Heidsieck or Krug, for example. Compared to most of the large firms, you will note those mentioned have a significantly more "toasty" or "yeasty" character. 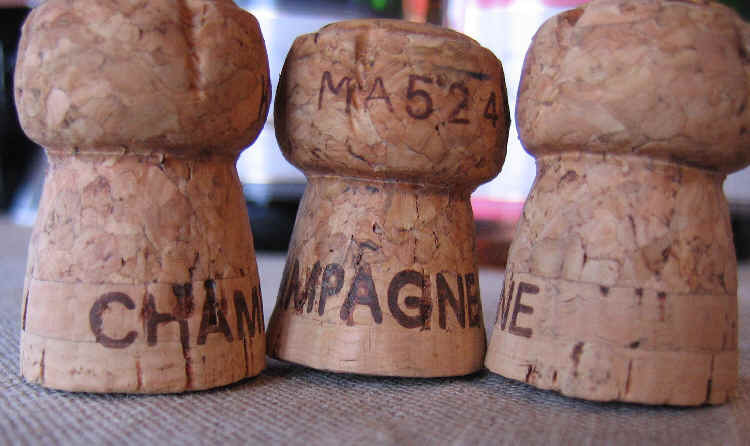 For vintage-dated Champagnes, most firms have a five year aging cycle. The law requires vintaged wines to be three years old before release. At a seminar on Champagnes, one winemaker noted that virtually all the firms, despite their claims to the contrary, disgorge their non-vintaged products "fifteen months and two hours" after setting them in the cellar. Those A-Framed racks in that photo show the bottles in "riddling racks." This endeavor, known as "remuage" is a slow and labor-intensive method of starting the process of removing the spent yeast from the bottle of wine. "Riddlers" go through the cellar and twist and turn the bottles over a period of two or three months. Each time he handles the bottle, it is inclined at a higher level to allow the sediment to collect against the crown cap which seals the bottle. Many firms now have "gyropalettes," very large machines (VLM's for short) which can "riddle" the bottles constantly in as little as a week or so. Finally, the bottles are set in a freezing brine solution to freeze the sediment of yeast. The bottles are then opened and the CO2 gas pushes the solidified yeast "plug" out of the bottles, (hopefully) leaving the wine free of sediment. The bottles are then topped with wine to a particular level. To this, the Champagne firm will add a "dosage." This determines how dry or sweet the Champagne is. The next step determines how dry or sweet your bottle of Champagne is. This step, if employed, is called the "dosage." It is usually some wine and sugar syrup, though a few claim to include brandy or Cognac in their dosage. Those who use brandy contend it adds a note of complexity. Those who do not say it detracts from the wine. A few wines are non-dosaged Champagnes. These are often so dry and acidic that they are not palatable to most tastes. Look for "Non-Dose," "Pas-Dose," "Extra Brut," "Brut Integral" or "Brut Zero" on the label. More "normal" are those designated as "Brut." These typically have a slight bit of liqueur d'expdition (the dosage) added. The Champagne laws do not regulate the level of sugar allowed in the various designations of Champagnes. Generally speaking, however, you'll find something like 6-13grams per liter in "Brut" Champagnes. Those called "Extra Dry" are not at all "dry," having usually 10-30 grams per liter of sugar in the finished wine. Since Champagne tends to be so high in acidity, the combination of CO2 and acid tend to mask the sweetness. The Champagne producers specializing in the "Extra Dry" wines, tend to use inferior fruit for those wines. This is because the sugar masks the modest quality of the wine. Vintage-dated Champagnes are, for the most part, "Brut." You can find demi-sec, or mildly-sweet Champagnes. These are not terribly popular at this point.